Ronon and Teyla are off world when they come across a body in the woods, as they approach hidden traps are sprung and in the chaos they are both stunned, Teyla is left and Ronon abducted by an old friend who as is the norm came back to bite him. The tracker Ronon carries is not active so the suggestion is made to contact Solen Sincha another Satedan who may have some information on Tyre the man who kidnapped Ronon. They learn that his Wraith masters have abandoned him and maybe by giving them Ronon a former runner he will regain their favour and this is exactly what is happening. Ronon is given to the Wraith who begins the torture procedure in the effort to get Ronon addicted to the surge of life energy after they kill him, they succeed and Ronon pledges his loyalty to the Wraith. Information arrives about a Wraith lab on the planet Sarif Sur so Tyre and the team mount a raid but they are captured and it seems Tyre has betrayed them but it’s a ruse and when he gets the opportunity he breaks John, Teyla and Rodney out and the battle commences. The Wraith is captured and when threatened with the explosives planted earlier he agrees to release them when Tyre says he will stay behind and hand over the detonator when the team are free, however Tyre redeems his honour by destroying the lab and saving his friend Ronon who still has a long road ahead to purge his system of the enzyme and reverse the mental conditioning. 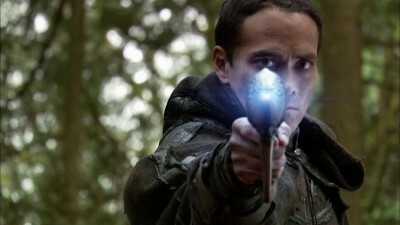 Broken Ties is an episode which quickly brings the talents of Mark Dacascos back to Stargate, an accomplished and well trained fighter he is more than capable of holding his own acting wise and bringing a level of reality to a staged action sequence, nothing quite beats being able to use the primary actor for the majority of a stunt. While the dynamic between Ronon and Tyre was certainly the focal point and allowed Jason to dig deep into his own talents to bring to the screen another facet of Ronon we also got the dilemma Teyla was having to deal with being a new mother want to remain at her childs side but having the drive to be the guardian for all. In an episode that had some strong themes it’s surprising we got the usual amount of comedic elements scattered throughout the episode, Woolsey is the major foil for such things as his character settles into the group dynamic and if you need that extra giggle then Rodney in a bubble bath serves it’s purpose. We want to thank Tim for joining us for this episode, he replied to a tweet on the night of recording so we invited him to join us and he said yes so everything worked out great. You can hear Tim on Partial Nerdity and Unchartered Territories two podcasts that I listen too on a weekly basis. We also would like to thank everyone that has voted in the poll which at the time I write this is 94 people, if we get over 100 giving us their Stargate SG1 top ten episodes we’ll throw in another prize for the draw with our thanks. This weeks promo is for British Invaders a podcast that looks at old UK television shows with a scifi/fantasy/genre leaning and next week we are going to be taking a look at The Daedalus Variations with Thomas, we hope you can join us for that.